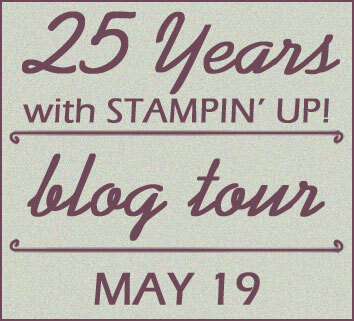 I hope you’re enjoying these two RemARKable blog tours every month. 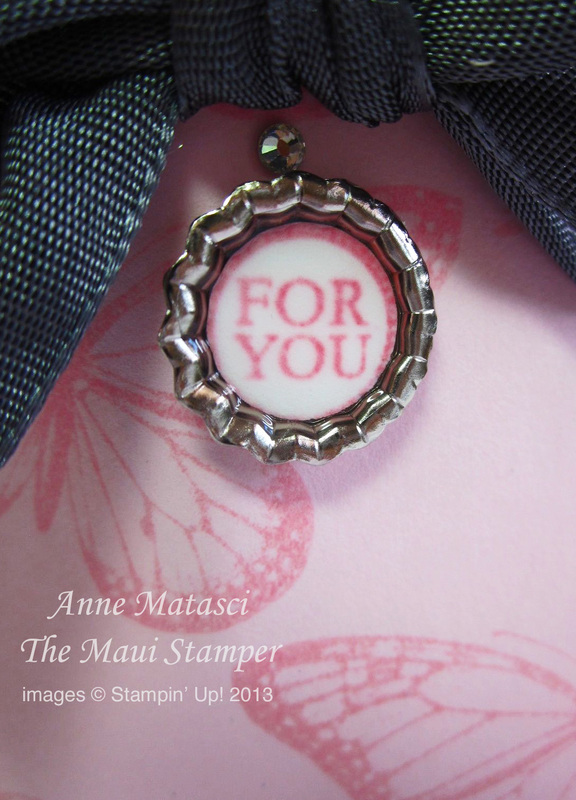 We’ve just lined up our next few sets for the Stamp of the Month Tour on the second Sunday every month (and NO, I am NOT going to spill the beans – come back and see what they are!). The third Sunday of the month is reserved for the 25th Anniversary “Best of” releases throughout 2013. We are working a month behind so that we have plenty of time to create, so this month we are featuring the April set, Best of Butterflies. I’ve made 3 different projects for you. In addition to the 25th Anniversary Best of Butterflies stamp set, I’m featuring 3 Big Shot dies that are on the Retiring Products list. That means that these 3 dies are currently being sold on an “as available” basis – when the last one is sold, it’s gone! 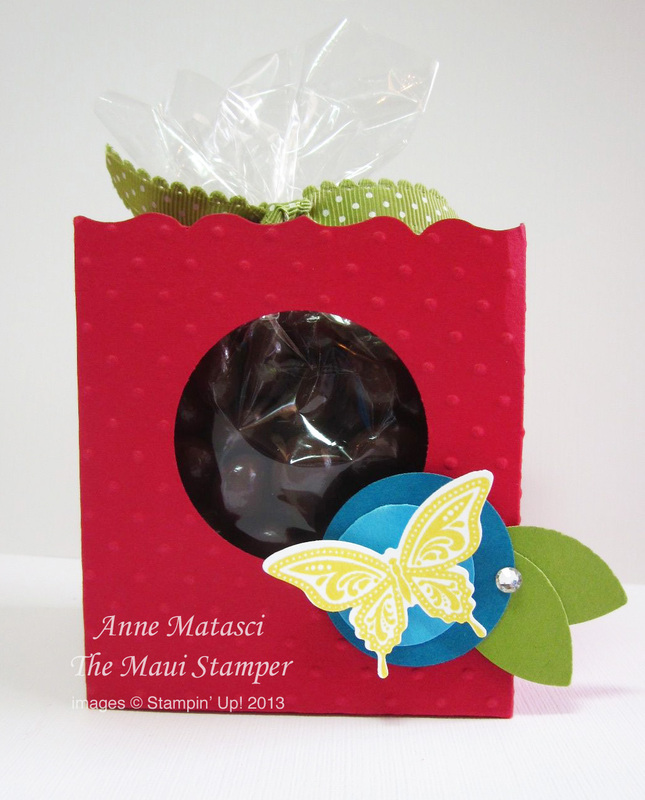 The butterfly I chose for this project coordinates with the Elegant Butterfly punch. A little TIEF on the box, a couple of circles and leaves, and this project is ready to go! The Two Tags Bigz die is another favorite I am sorry to see leave our lineup. I’ve used both of these shapes for countless projects. 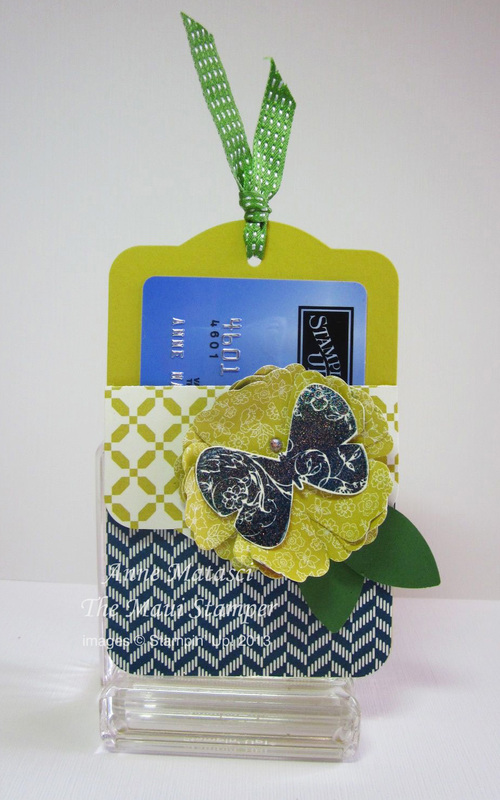 This one is popular at craft shows – two of the fold-over tags adhered with a smidge of Tombo (the Wonder Adhesive) to create a gift card holder. 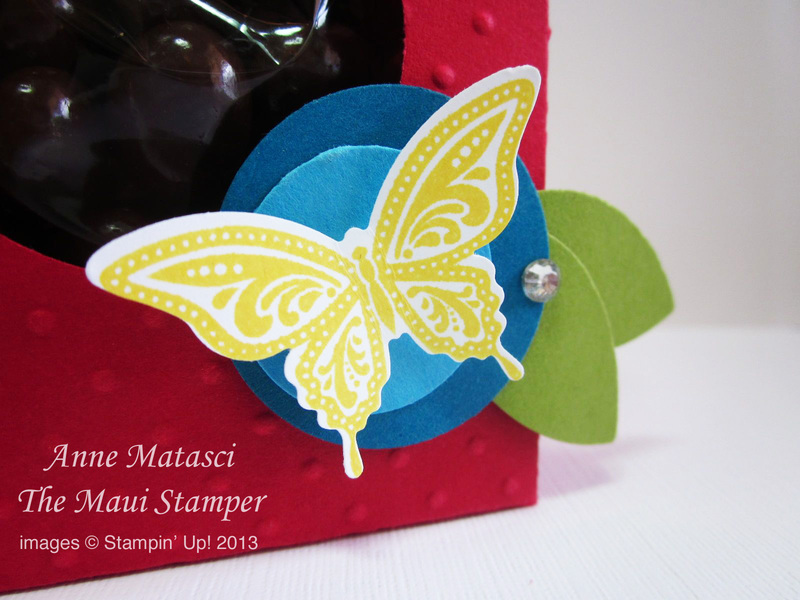 This butterfly was embossed with Irridescent Ice and hand-cut. Again, a couple of flowers, some leaves and a little bling and you are in business! Don’t miss out on that gorgeous 1 1/4 inch Two Tone Ribbon either – that is not carrying over to the 2013-2014 Annual Catalog. I’m stocking up!! I did create a little tag with the smallest Soda Pop top and drizzled a little Crystal Effects on top for extra shine. Time to flutter over to the Trinity Design Studio and see what Robin has created for you! Fantastic projects as always, Anne. They should sell some of those dies for sure! Thanks Michele – love that die! Beautiful projects Anne! I love the two tags die gift card holder. I am sorry to see that die go as well. Thanks Debbie – that gift card holder is very popular and has the added benefit of being easy. I sold a bunch of Two Tags dies the other night showing that project! Ingrid, to know that die is to love it! I’m sure you’ll find lots of inspiration in the Two Tags.